Right after referring to our VPS plan page, our potential customers used to raise the sales chat. In 85% cases, the first question we have been asked is… What is vCPU? That prompted me to write an article on this topic. Although, vCPU mathematics is little tricky to understand ,however we have put together all possible information and tried to explain you it in most simple words. Sockets represent the hardware. They are referred as number of processor sockets that your motherboard is having. Sockets are only capacity of motherboard. Socket can be empty. The real power is number of processors that are actually installed on motherboard. A physical CPU is actual hardware unit installed in motherboard socket. It is an actual physical processor/core in your physical CPU chipset (Multi-core processors). Each physical core acts as separate processor since it has its own circuitry and L1, L2 cache. Logical processors are abstractions of time on stack of physical processors. Logical processors act differently in physical machine (stand alone) and in Hypervisor. In the context of Hypervisors a Logical processor is equal to vCPU but Logical processor does not equal a physical core in any virtualization software. vCPU is time dependent entity. A virtual processor is more likely amount of processing time spent on the CPU. If we use technical terminology; Virtual processors are mapped to available logical processors in the physical computer and are scheduled by the Hypervisor software to allow you to have more virtual processors than you have logical processors. People may have misconception that 1 vCPU equals to 1 core. But there is no one to one relationship between vCPU and core in any virtualization software. 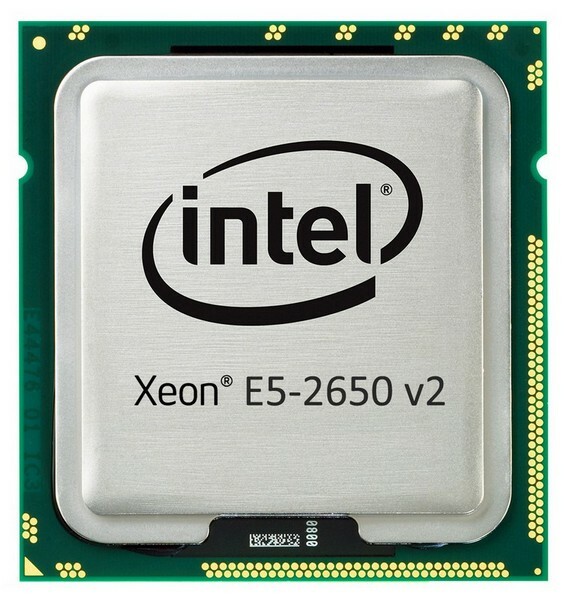 Intel Xeon CPU E5-2650 v2 holds 8 Cores x8 = 64 vCPUs. As long as you don’t have CPU exhaustive VMs you can go beyond this number 8. The number of virtual cores that can be assigned to a VM is limited. Windows Server 2008 R2 limits the number of vCPUs as 4 per VM which is extended to 64 in Windows server 2012. 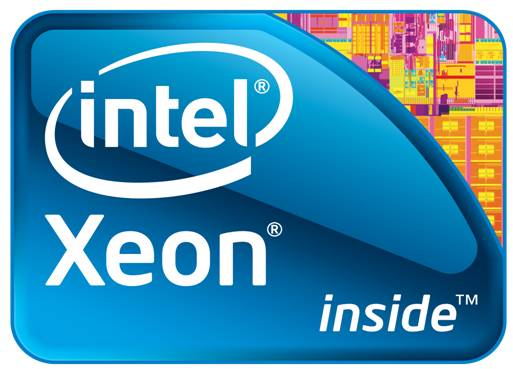 The Intel Xeon CPU E5-2650 v2 has only 8 cores. You mentioned 16 cores! It has 16 threads as each core can support 2 threads. So 16 vCPU shares 1 core of 2.6Ghz. So each vCPU only has 0.1625 Ghz! That’s so little. 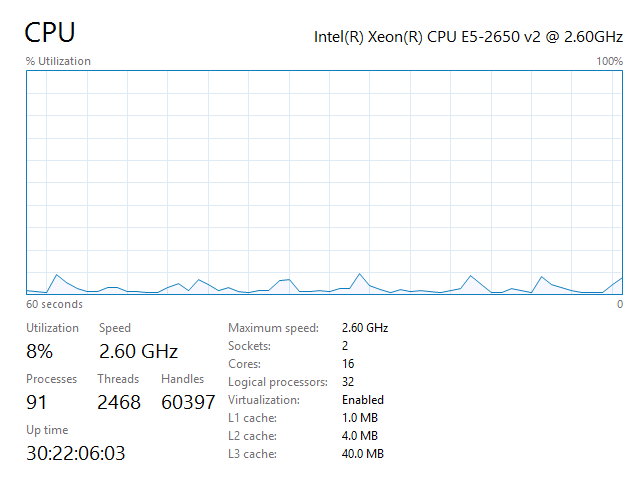 This is why VPS with 1 or 2 vCPUs are very slow. The other thing to notice is that the real speed of each vCPU depends on the model of the real CPU. The newer and more expensive ones are faster so teh vCPUs are faster too. But then nothing stops hosting companies to dilute that power by adding more vCPUs per physical core. So there does not seem to be any standard at all. There is no way for users to know how fast each vCPU is unless the hosting company publish info on vCPU they have set up in term of clock speed in Ghz. Thanks for the feedback. We have updated the CPU cores and the table on the blog. Please note that we are considering 8vCPU/cores and not 16vCPU/core as recommended by Microsoft here.